Art Collector Sells A Lichtenstein For $165 Million To Fund Criminal Justice Reform : The Two-Way Agnes Gund sold Roy Lichtenstein's Masterpiece for an eye-popping sum to support the new Art For Justice Fund. The group will fight against mass incarceration and support released prisoners. A visitor stands in front of Masterpiece during a press preview of "Lichtenstein, a Retrospective" at the Tate Modern in London in 2013. The iconic painting was owned by Agnes Gund, who recently sold it to fund a new criminal justice reform fund. 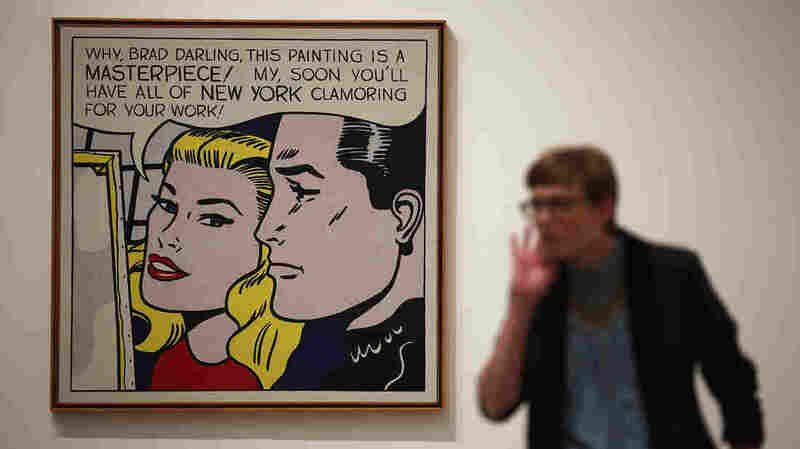 On Monday, The New York Times confirmed that the sale was real, noting that the painting becomes one of the 15 most expensive pieces of art known to have been sold. And the newspaper revealed that Gund sold the piece "for a specific purpose: to create a fund that supports criminal justice reform and seeks to reduce mass incarceration in the United States." Gund is urging other wealthy art collectors to sell prized pieces to support the effort, NPR's Elizabeth Blair reports. "Gund says $100 million from that sale will go to the new Art For Justice Fund, described as a 'movement to end mass incarceration,' " Elizabeth says. "Other collectors have also promised gifts of art or donations to the fund, which is being managed by Rockefeller Philanthropy Partners and the Ford Foundation. "According to a statement, the fund will support efforts to cut the prison population and strengthen programs to help people when they leave prison," Elizabeth reports. "Six of Ms. Gund's 12 grandchildren are African-American, and she has worried about their future as they've matured, particularly in light of shootings of black teenagers like Trayvon Martin in Florida.
" 'I have always had an extreme sensitivity to inequality,' Ms. Gund said. "She added that she was also deeply affected by Michelle Alexander's 2010 book, 'The New Jim Crow: Mass Incarceration in the Age of Colorblindness,' and by Ava DuVernay's 2016 documentary, '13th,' about African-Americans in the prison system." "The criminal justice system in its current state — particularly in its treatment of people of color — is unfair and unjust," Gund said in a statement from the Ford Foundation. The fund will issue grants to groups and individuals working on issues of criminal justice reform.